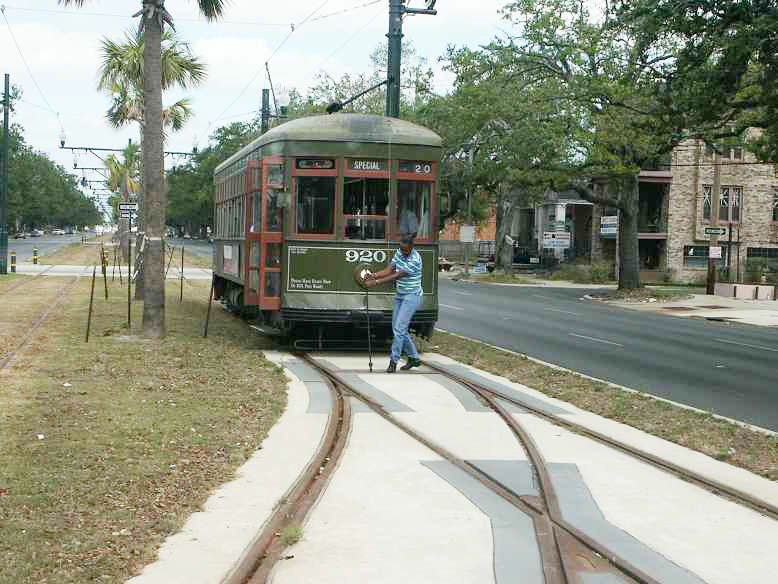 Having had family and in-laws in the New Orleans area for decades, and being especially fond of the street railways, I have been a regular visitor to the Crescent City for over 35 years. I have long felt a special affinity for the city so I have followed the tragic events after Katrina’s arrival in August, 2005 very closely. In the months that followed I was quite anxious to travel to Louisiana (from home in Boston) to see what happened first hand and to provide at least a tiny bit of help to the economy. As luck would have it, I couldn’t schedule a visit until April of 2006, when I finally made it over Easter/Patriot Day weekend. As many contacts and friends expressed interest in advance in hearing my impressions, I composed this note to cover my impressions and findings of both the city in general and the streetcar lines in particular. After crisscrossing the city by car, the theme that kept coming to me was “A Tale of Two Cities.” A surprisingly large area along the Mississippi from Bywater through Faubourg Marigny, the French Quarter, the Central Business District, the Warehouse District, Magazine Street, the Garden District to Riverbend in Carrollton seemed remarkably unchanged and normal. Wind damage to roofs was visible in places (with blue tarps covering unrepaired areas) but the overwhelming feeling was one of normalcy. The vegetation was lush and green with spring blossoms everywhere on gorgeous sunny days. There may be only an estimated 200,000 of the pre-Katrina 400,000 residents of the city on hand, but 200,000 is still many people, especially as most of them are concentrated in the 20 percent of the city that wasn’t flooded. Traffic was heavy and people were bustling about their normal lives. In the French Quarter, where we stayed in a small hotel, there were plenty of tourists and most businesses were open. There were some shuttered or abandoned storefronts, but seemingly only a slight number more than usual. Hours were restricted in some businesses likely due to staff shortages. Our hotel could not offer full housekeeping service (no daily linen changes and cleaning) for that reason and some businesses have adopted a Wednesday through Sunday or similarly abridged schedule. Streets were cleaned a bit less efficiently and promptly than usual, but the overall impression was one of near normalcy with the customary spirit. The same was true in Marigny and along Magazine Street where we also spent time. The other city, of course, was the huge expanse of devastation. Roads are mostly clear and open so one can drive into the flooded areas with no restriction. In many places traffic signals are missing or unpowered, so low-mounted temporary “Stop” signs are located at intersections and are extremely easy to miss given the eye-catching scenes along the streets in every direction. 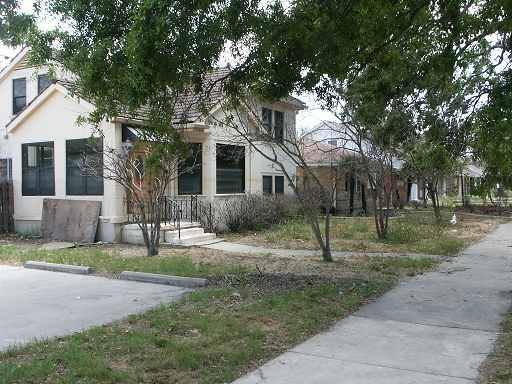 An abandoned and stripped house in Lakeview with the high water mark visible. 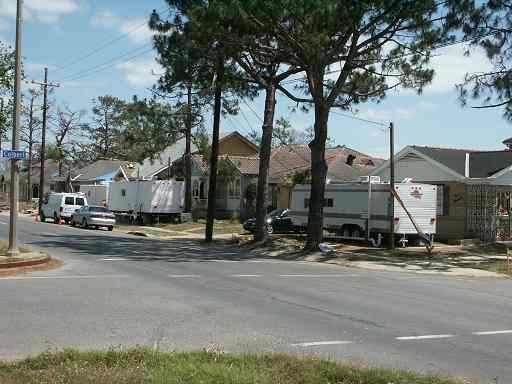 Temporary trailers outside several Lakeview homes. 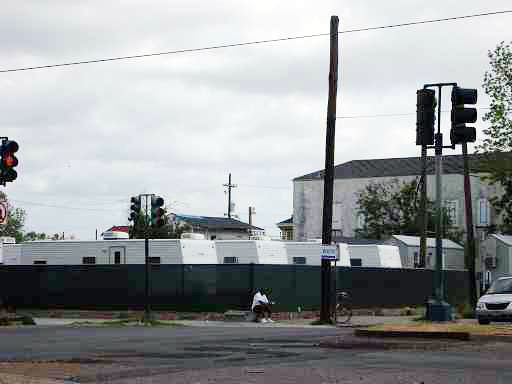 FEMA trailer parks such as this one have appeared on vacant lots in many places in the city. 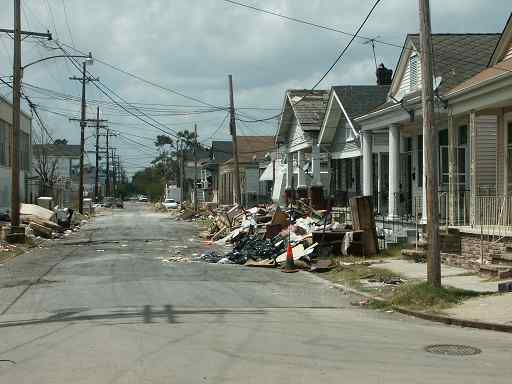 Typical devastation in the hard hit Lower 9th ward. 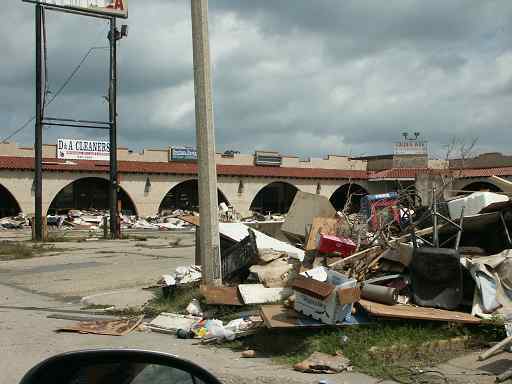 A strip mall destroyed in New Orleans East. Modern townhouses in New Orleans East abandoned after flooding. 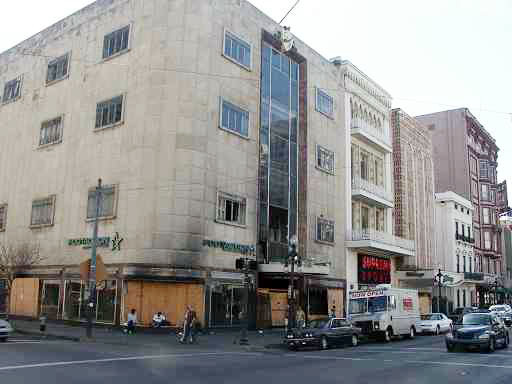 A burned out retail building on Canal Street at Carondelet. Devasstation on a side street next to Canal Station/Randolph SIS. We all saw the maps, aerial photos, and satellite images of the devastation but somehow the vastness of the impact becomes clear only when you drive for mile after mile through an urban area with no break in the destruction. Much play has been made in the national press about the racial element of the devastation, as clearly many, many African Americans suffered unspeakable losses. However, they were not alone as the largely white Lakefront and neighboring districts also were devastated. 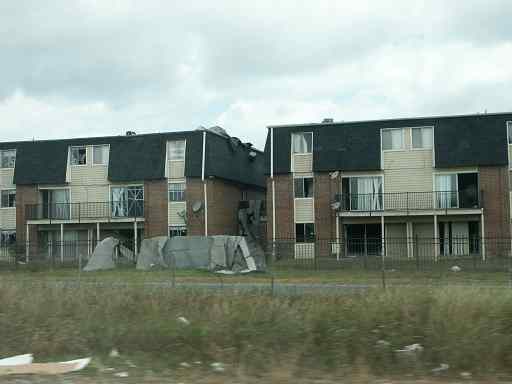 Also badly damaged were huge areas of post-1950s suburban sprawl along I-10 in New Orleans East. The lower 9th ward, the low-lying poor neighborhood to the east of the Industrial Canal (and just over the bridge from the former terminus of the Desire streetcar line) was very hard hit as houses—many of which were flimsy and substandard and possibly weakened by the ever-present termites—were destroyed by the water cascading in from the long canal levee breach. The conditions there appear bleaker than other neighborhoods and apparently no utilities have been restored, so there are no evident signs of occupation or rebuilding and most buildings are clearly beyond salvage. Other formerly flooded areas of the city including Gentilly, Mid City, Broadmoor, and Lakeview, show a bit more signs of life. FEMA trailers are in the front yards or driveways of some houses—there might be one per block or occasionally two per block – sporadic at best. 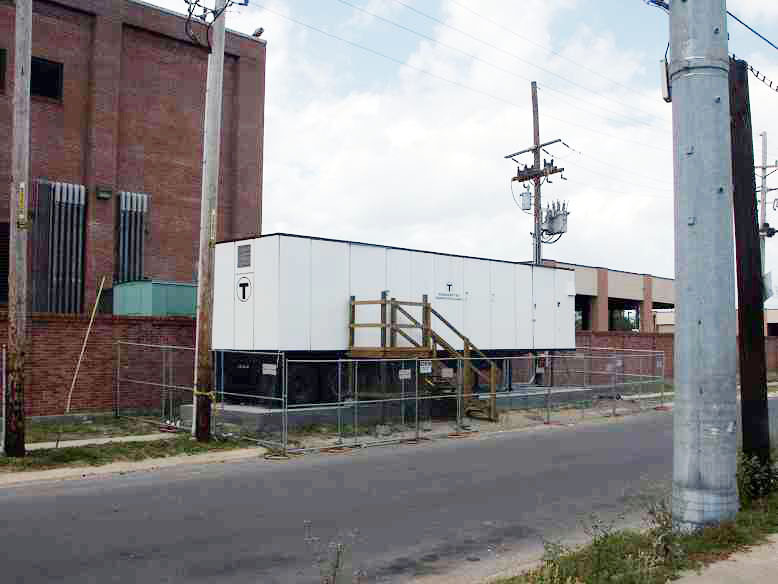 The trailers are up on concrete block stacks to level them, have pipes running to sewer connections, utility drops attached, and wooden stairs built to reach their doors. In some cases the residents appear to be working on their houses, in others there is no sign of activity. The vast majority of houses in these neighborhoods appear to have had their interiors stripped to the studs and in most cases the debris hauled away. In some cases the debris and old furnishings are piled outside waiting pickup. The scope of work involved in stripping thousands of houses is mind boggling. Flooded and often wrecked cars are everywhere, awaiting removal. All over the city vacant lots have been turned into FEMA trailer parks with a large number of the standard white trailers neatly organized. 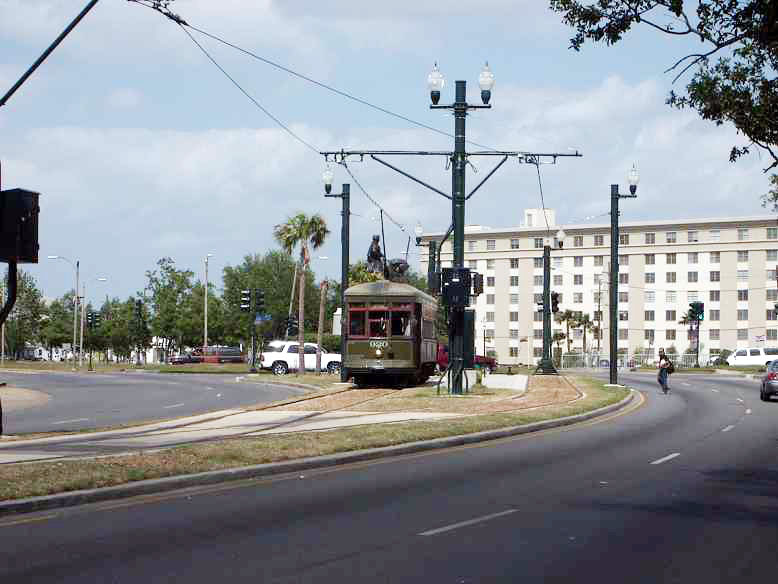 One of the most striking juxtapositions of the two cities is at the 17th Street Canal, which forms the boundary between Metairie and the Lakeview district of New Orleans. The east levee of the canal failed and devastated the New Orleans neighborhood. Yet just yards away on the Metairie side life goes on as normal. The sharp border formed by the canal is striking. As a fan of classic New Orleans architecture, one of the losses I feared from Katrina was the destruction of so many of the classic ornamented structures--such as the classic shotgun house--as they have always been found all over the city, even if in poor condition in less prosperous neighborhoods. Though many have in fact been damaged, the one reassuring aspect is that many of them survive in the non-flooded neighborhoods closer to the river. The Central Business District in general looks good, except for the oft-photographed Hyatt with its blown out windows and several other towers also on Poydras near the Superdome where wind shattered windows and the buildings are now vacant. The giant art-deco Charity Hospital is in the same neighborhood and is largely or completely unused. The Superdome still shows the roof scars we saw so often on television, but a large banner proclaims that it will reopen in time for the Saints’ home opener in September. However, all of these buildings taken together mean that the end of the CBD close to the Superdome and I-10 looks quite bleak. Canal Street inside of I-10 is suffering as well. Closer to the river most businesses are functioning, except for a few burned out, as there was little flooding there. However, between Rampart (the edge of the French Quarter) and Claiborne/I-10 there is very little economic activity with several large hotels empty and damaged. In that area and also at the foot of Canal active reconstruction of sidewalks and curbing is underway meaning perhaps that the major Canal beautification program planned long before Katrina has begun. As widely reported in the press, Hispanics are playing a major role in cleanup and reconstruction. They are in evidence everywhere, and I understand that Lee Circle has become a key pickup point where each morning large numbers wait contractor vans that recruit workers for the day—as is common practice in the migrant worker agricultural regions in the west. The Port of New Orleans appears to be quite active as ships line the docks along the Mississippi. All of the cruise ships that housed rescue workers and displaced residents appear to have left. As one drives around the flooded areas a few anomalies appear. Esplanade is one. 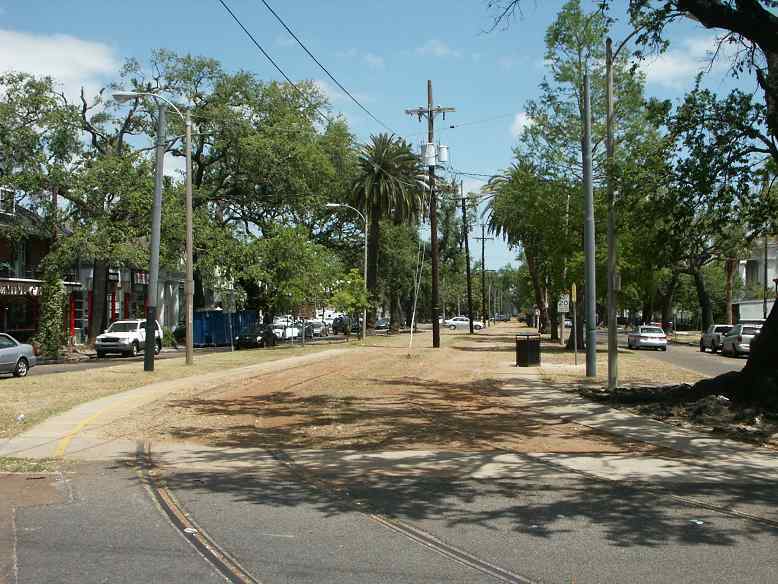 This avenue—that forms the back (northern or downriver) side of the French Quarter from the Riverfront Streetcar terminus and then continues out to City Park (terminus of the new Canal branch) shows very few signs of damage. Rehab has been underway along the street for at least the last decade and everything looks fine now, even though neighborhoods to either side suffered badly. 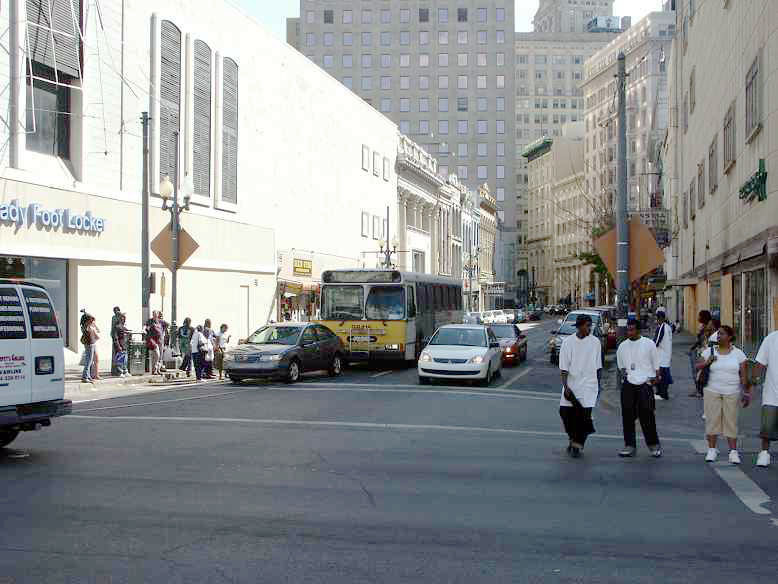 A check of topographic maps shows that the street was laid out on top of a relatively high ridge, so no more than one to two feet of Katrina’s water covered it. The route of US 90 in from the east is a somewhat similar island of less damage as it, too, was laid out along the slightly higher Gentilly ridge. Huge numbers of cranes are in evidence working along the damaged levees on the 17th Street and London Street canals (sites of two of the breaches). One hopes that the levees will be secure before the onset of another hurricane season. On Sunday April 2, 2006 the portable substation borrowed from the Massachusetts Bay Transportation Authority in Boston was placed in service and streetcars resumed running the length of Canal Street and out the branch to City Park. Service is being provided by Perley-Thomas cars from the St. Charles line as water never made it into Carrollton shop where those cars were stored. The Randolph SIS (formerly known as Canal Station), where the new Canal and Riverfront cars are stored, was underwater for several weeks putting all of those cars out of service. Perley-Thomas cars now running on Canal are numbers 915, 920, 923, 930, 940, 947, 961, and 965. 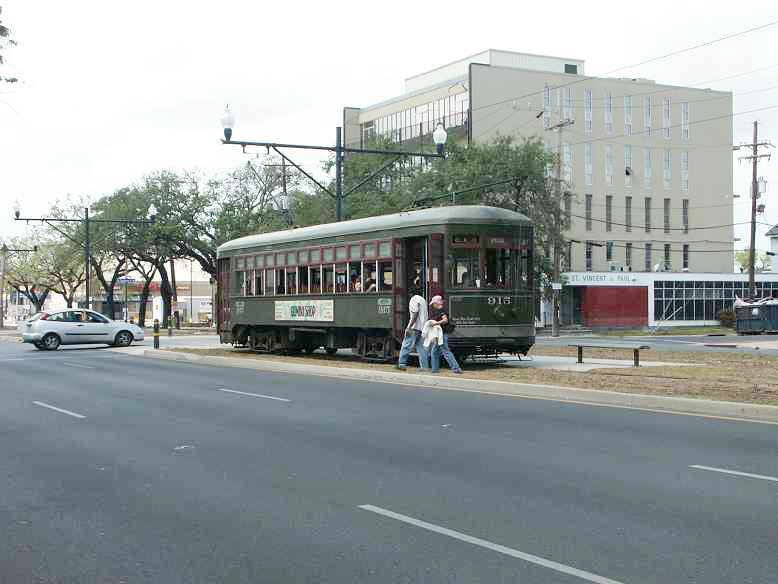 As well, Riverfront car 461, which escaped the fate of its brethren by being at Carrollton for maintenance work when Katrina hit, is running on the Riverfront route. No. 461 sports a new livery of light blue inside and out though there is no explanation as to why the new color was introduced. It’s possibly to reduce confusion along the Riverfront between the French Market and Canal when all cars were red. I have a number of times seen tourists ask Canal bound operators if the car serves the convention center, only to have the operator tell them to look for a car lettered Riverfront on the dash. Telling prospective passengers to look for a blue car would be easier. Time will tell whether the other Riverfront cars appear in this color after rebuilding. Car 947 heads out Canal in the Central Business District. 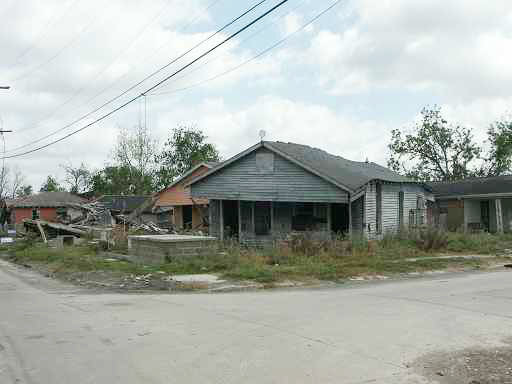 Car 920 short turns (due to a foot race crossing the line further out) in front of abandoned houses in Mid City. All cars are currently stored outdoors at the French Market. Car 965 heads outbound near Claiborne/I-10. Note sidewalk rebuilding to the right in the otherwise desolate area. The substation borrowed from Boston provides power at Canal Station/Randolph SIS. The flooded Canal and Riverfront cars stored at the back of the yard. Elmer von Dullen points to the high water mark on one of his cars. Car 920 heads inbound along North Carrollton on the City Park branch. 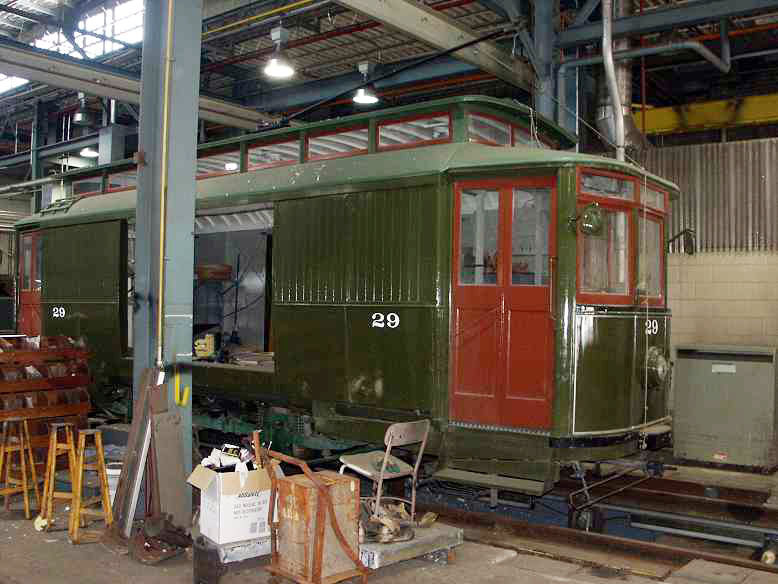 Car 920 changes ends at City Park. Flood depth was only 1 to 2 feet in this area. Passengers cross in front of car 915 to board (as the left front door can not be opened). Car 965 reverses at the Cemeteries terminus of the Canal route. Photo from Karl Johnson of Muni showing Riverfront 463 at Brookville's plant in Pennsylvania. Wonderful as it is to see the classic cars running on Canal for the first time since 1964, the fact is that most of their route is through a virtual ghost town. Very few businesses or residences along Canal outside of the CBD are in operation, as flood waters of four feet or more were the norm in most areas. The same is true of the City Park branch where flood damage was extensive for all but the final few residential blocks. The commercial areas remain largely vacant. Further out Canal, the classic Mandina’s restaurant—a noted venue for New Orleans cuisine—is closed from flood damage, but a banner proclaims it will return. Thus there are relatively few riders, abetted by the fact that the 42-Canal replacement bus service continues to run along the line between downtown and the Cemeteries (since Canal opened two years ago, buses from outlying neighborhoods normally run rushhour-only express service along Canal, with all other service by streetcar). Four cars are allocated for normal service on Canal, with two on each branch. Scheduled headways are about 25 minutes, though do not appear to be rigorously followed. Most cars have a comfortable number of riders, but nowhere near the pre-storm levels. No fares are charged for the present on all RTA services. Motormen (and women) are dressed in casual clothes, and are high seniority bus drivers. The St. Charles cars are configured for only right hand boarding, as all stops on that route are to the outside of the track. The rear door on each side of the car, though appearing to be a four leaf folding door, is actually configured as a push exit door with only the two center panels moving. On Canal beyond Claiborne/I-10 the platforms are between the tracks meaning that boarding normally occurs through the left front door. As the operator can’t open that door on the Perley-Thomas cars, passengers walk around the front of the car to board. (Very sparse automobile traffic and a bit of space between the track and curb make this less hazardous than it sounds). On the Riverfront stretch operators tend to stop at grade crossings just before or after the formal island platform stops so that patrons can board or alight directly to pavement. The St. Charles cars are not handicapped accessible (as that line was “grandfathered” by special waiver at the time of ADA adoption) so the current Canal service is not accessible, which may explain why accessible buses run parallel service. 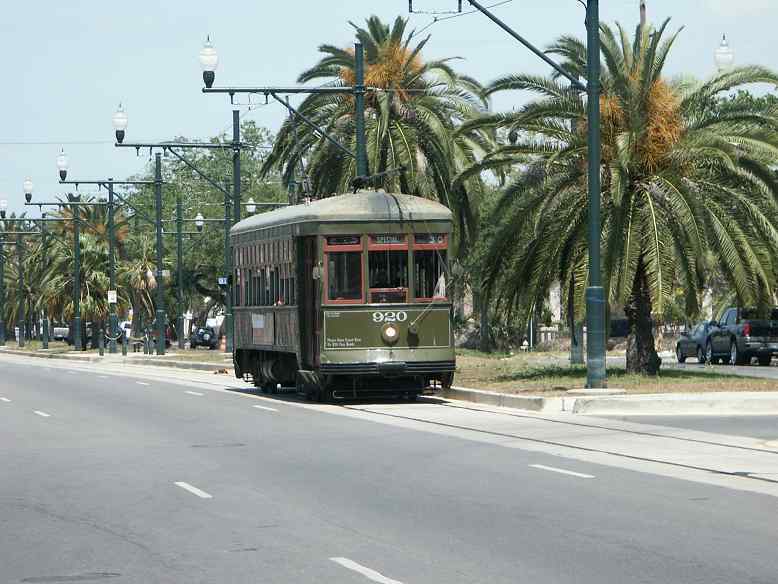 Both branches of the Canal route now run to the French Market terminus, unlike the pre-Katrina practice of the Cemeteries route terminating at the foot of Canal, with City Park cars continuing to the French Market. Unfortunately, Perley Thomas cars no longer carry the classic Canal destinations on their rollsigns so that all cars run signed “Special” now. 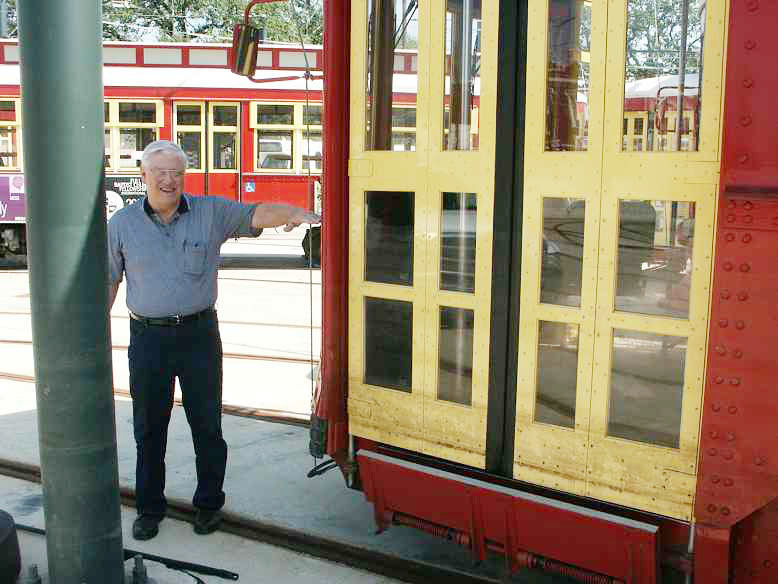 I have had the pleasure of knowing for many years the legendary Elmer von Dullen who in many ways is the guiding light of the New Orleans streetcars. He is the last true street railway man in the country to have spent an entire working career caring for a fleet of conventional pre-PCC streetcars. He ran the shop at Carrollton Station for years and is the father of the rebuilding of the Perley-Thomas cars, and the design and construction of the new Riverfront and Canal cars. During this visit I spent much of a morning with him, which I felt quite fortunate to do as Elmer has postponed his retirement several times, most recently to help bring the system back post-Katrina. He now is planning to retire this July, and if he does it will mark the end of an era. By the way, Elmer lives west of the airport and suffered no significant damage to his home from the storm. We started at Canal Station (Randolph SIS). The borrowed substation from Boston is in place on the south side of the site (North White Street) just outside the fence. The unit's circle-T logo and home lettering are plainly visible and it is set on a specially poured concrete pad—to keep it from sinking into the soft soil. It is now fed by 24,000 volts instead of the 13,000 for which it was designed. Consequently, external transformers bypass much of the AC circuitry inside the van. The flooded cars, which spent nearly three weeks in not-very-clean water, still look sad. An order was issued from on high not to clean them, so pollutants continue to turn aluminum parts into white powder. The cars were in about four feet of water which submerged them part way up the farebox and up the bases of the seats. Contrary to some reports the floors are fine as they are marine plywood (sealed on all sides) as used in boats. The steel structure is also largely intact with only minor paint failures. Sandboxes were damaged. All underfloor equipment was severely damaged so needs rebuilding or replacement. The controller cabinets inside the cars are high enough that most of the circuitry remained dry. The roof mounted air conditioning units are also undamaged. The seats, including the wooden cushions and backs, also largely survived. Nonetheless, preliminary estimates of rebuilding costs are in the vicinity of $1 million each—approaching the roughly $1.2 million it cost to build the Canal cars several years ago. The cars have all been moved to the back end of the site (furthest from Canal) where they were successively placed as Elmer’s crew removed all of the underfloor equipment (choppers, pumps, inverters) in preparation for sending those components to be rebuilt, and the parts are all stacked near the rear wall of the complex. At least one car is covered with New York style graffiti but other than that the cars seem free of the rampant vandalism and destruction that happened many places in the city post-Katrina. As has been published, Brookville Equipment (builder of the trucks and controls) moved one car of each series to their Pennsylvania plant at their own expense shortly after the flood. The plan developed by Brookville and Elmer called for rebuilding the trucks at Brookville, with replacement of the GE motors (which have been somewhat unsatisfactory) with Czech DC motors (as on the Riverfront cars). Also control equipment would go to Brookville for rebuilding. Elmer sent an inverter to builder ABB in Switzerland to evaluate it for reconditioning, but they found the aluminum components so badly corroded that replacement will be needed. 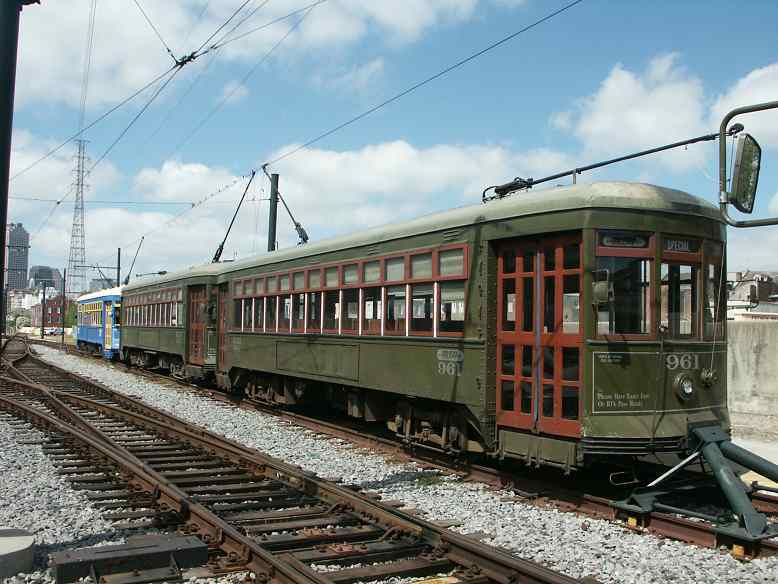 Body work would be done in New Orleans, with Brookville staff equipping the cars as they did during construction. However, this plan never made it to formal bid and contract award as a stop work order came from the top of the RTA. There’s no word on when this might proceed. Elmer had hoped to oversee the rebuilding before retirement, but this now looks unlikely. 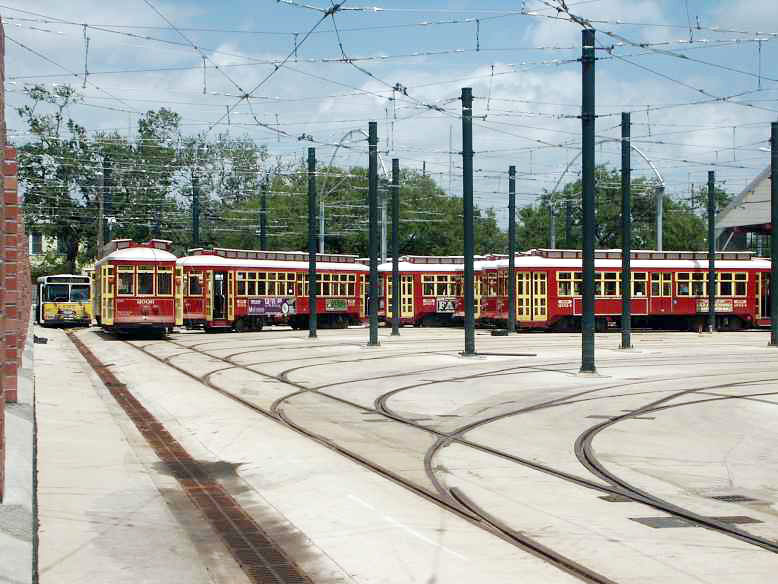 The Canal facility is being readied to house the active cars, which remain stored outside at the French Market, but the city has mandated rewiring of the nearly-new building. Temporary wiring is being strung to allow use in advance of that work. The main office building at the site (which housed several hundred storm refugees before they were evacuated by boat) remains damaged and vacant. Staff working on the site are in temporary portable offices. Elmer reports he first visited Canal Station three weeks after the flood when the water had receded, but was escorted by a substantial armed guard and helicopter air cover. The neighborhood was at the time quite hostile, with military air units occasionally taking fire from the ground, which they reportedly returned with deadly effect. The line is still about 18 months from resumption of service as December, 2007 is the tentative resumption date. Branches brought down by the storm badly damaged the trolley wire and before the storm a contract to renew the wire had been signed and was nearing its start date. Post storm it was decided that completing this project before restoring service would be more efficient. Elmer is now spending his time helping to guide the contractor, Boh Brothers, as this project proceeds . 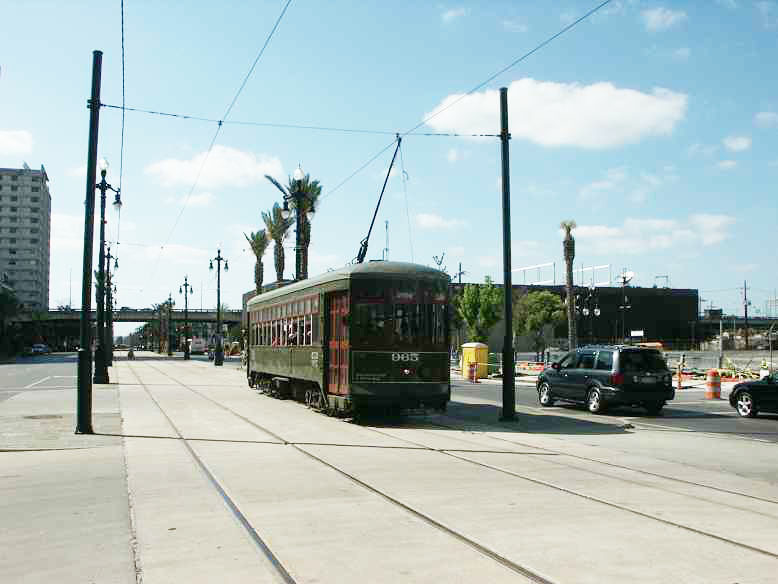 All trolley wire over the entire line has been removed (except for the one block on Canal), along with the majority of the bracket arms, giving the line a decidedly abandoned look. About 270 poles will be replaced and crews are pouring footings for the new poles, concentrating now on Lee Circle. Suspended feeder cable has been left in place along the line and will be reused. St. Charles line track at Riverbend is overgrown. Note the lack of overhead wire. 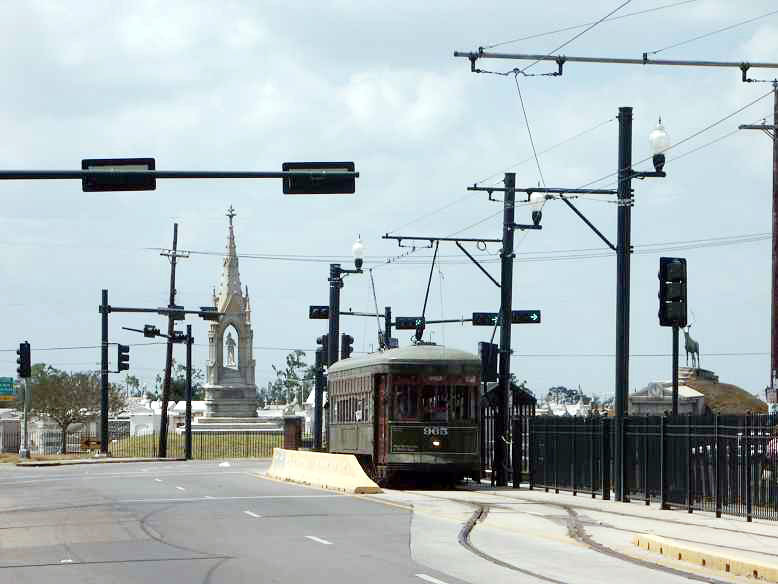 A substitute St. Charles bus boards passengers at Carondolet and Canal. Track is present but wire is missing. Ford, Bacon & Davis sand car 29 has been beautifully restored and is inside Carrollton Station. Riverfront car 461--that escaped flooding because it was at Carrollton--now sports a light blue livery. The nine cars running in town were pulled along the line from Carrollton by a dump truck, which had to use considerable power as the tracks are partially covered with silt and other debris. As the overhead work goes on Elmer has kept one track free of equipment in case any further movements are needed. Plans had called for 20 additional cars to be taken in town to provide service to the Jazz festival (held just beyond the end of the City Park branch) at the end of April, but it appears that plan has been dropped in favor of bus transportation. 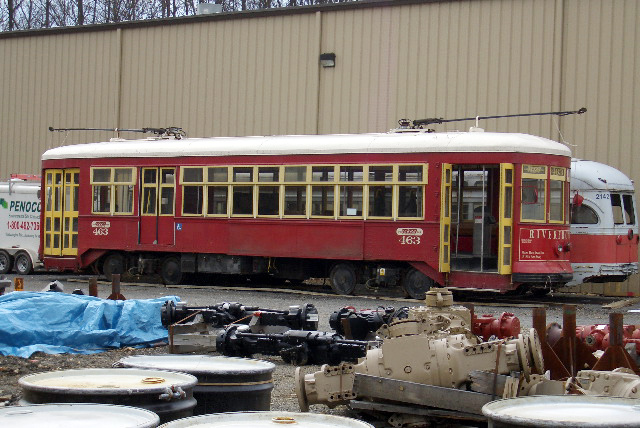 At Carrollton Station, the remaining 27 Perley-Thomas cars are stored safely inside, along with the two ex-Riverfront cars, deck roof ex-training car 453, the loaned San Francisco cable car, and Ford, Bacon & Davis single truck sand car 29. This last car received an extensive and expert rebuilding following a controller fire. The highly accurate reconstruction proceeded under Elmer’s direction with skilled woodwork done by the shop’s remaining master carpenter, who has since retired without replacement. The car looks wonderful, but will probably be the last such rebuild as there remains only a skeleton staff, and the RTA is planning a further major staff reduction system wide. The shop was eerily empty compared to its traditional high level of activity. Skills required to keep the classic cars running are in very short supply. Long term prospects for the city and its transit service remain unclear. The city is potentially facing bankruptcy as its already-weak tax base (mostly sales tax) has been severely eroded by the decreased number of residents and visitors. Shortages of housing, delays in siting more trailers, and still-unclear rebuilding guidelines make the return of more residents problematic. More transit service will depend on more people needing transport. 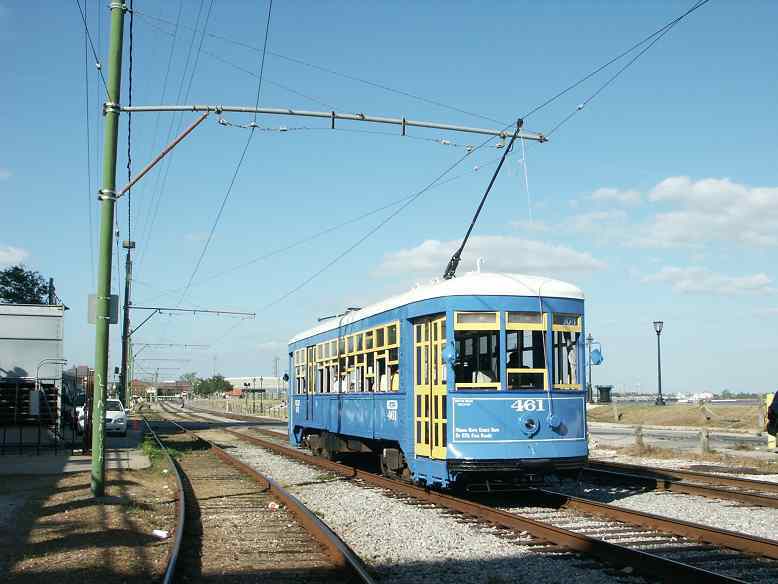 But the city’s commitment to its classic streetcar service is clear given the effort expended to get some service started and the work underway to restore St. Charles. Planning commission reports have also called for extensive streetcar and light rail lines to help spur economic development, but heavy federal funding will be needed to make that happen. 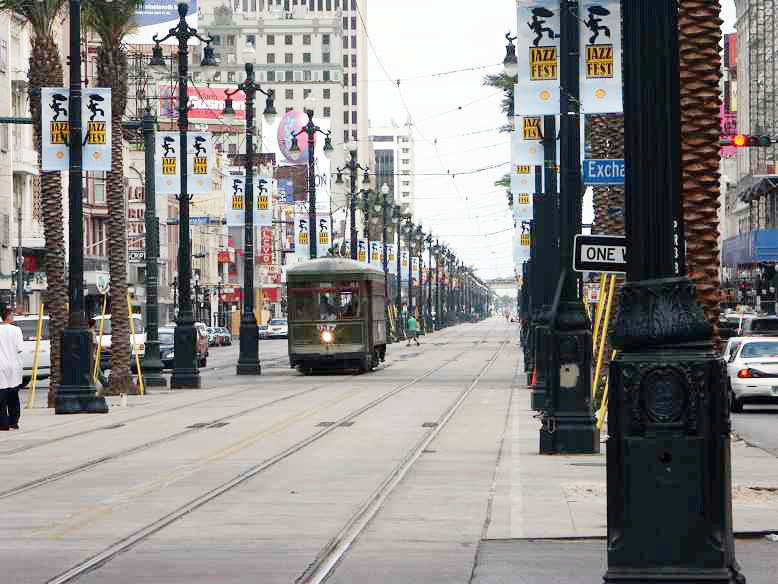 The New Orleans residents who remain clearly love their city and are determined to see it reborn. Let’s hope they receive the support needed to make it happen.